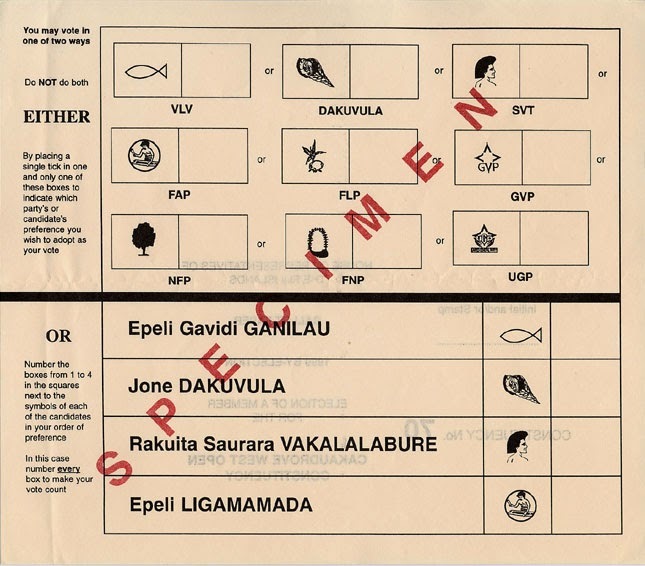 International Elections: Fijian elections-a lesson in poor ballot design? Fijian elections-a lesson in poor ballot design? Fiji's elections happened yesterday, and at the moment, the party of current leader Frank Bainimarama (I hope that's correct) is leading by a wide margin, with 60% of the vote. These elections are historic for Fiji. They are the first elections where all Fijians will be voting in the same constituency, with no racially-divided electoral boundaries. They are also the first elections of any sort since 2006; Fiji has been ruled by a military dictatorship since that year. In order to hold a race-blind election, a new electoral system was introduced for Fiji's 50 member House of Representatives. The system is open-list proportional representation with the D'Hondt method and a 5% threshold. Under the open-list system, voters vote for a party and for a candidate within that party. This creates problems with ballot design, especially in systems with high magnitude, as a large amount of candidates must be listed on the ballot. Different countries have different ways of solving this problem. In Belgium and the Netherlands, all candidates of all parties are listed on the ballot, which is easy to understand for voters, but also leads to large ballot papers. In Italy, voters must write the name of a candidate in a box next to the party that they are voting for, and in Latvia and Sweden voters choose a ballot (one for each party), mark or write a candidate on it, and place it in an envelope and in the ballot box. Fiji has gone for a different approach, and it is one that is used by some other countries. In this system, each candidate is assigned a number. To vote for a candidate, you mark the box with that candidate's number in it. Colombia and Finland use this system. However, Colombia's ballot paper shows party logos, and gives voters the right to cast a party vote. This means that voters who know none of the candidates can cast a 'party vote'. Finland's system is similar to Fiji's, in that voters must write the registration number of a candidate in a circle, and candidate names are printed on posters. However, the Finnish have more experience both with voting and with voting with that particular system, while it is the first time for the Fijians in the latter respect. Below, I have a photograph of the ballot paper for Fiji's last election in 2006. The voting system used for this election was the Single Transferable Vote in single-member electorates. 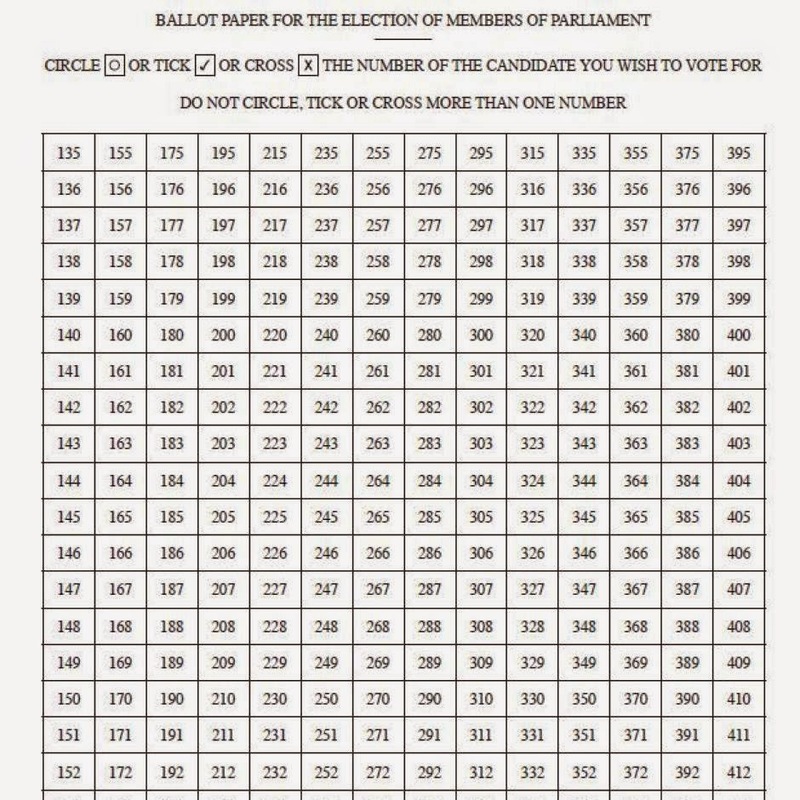 Voting for a party (placing a tick in a box) in the top section would count as a vote for that party's ticket, while voters voting in the bottom section had to number every box. This ballot paper is much easier to understand. Parties would be able to use symbols to campaign, and elderly and first-time voters would have no trouble voting. The new open-list ballot paper is much more confusing. Voters cannot see the candidate or party names on the ballot, meaning that they may vote for the wrong candidate. The small boxes may confuse elderly voters, or voters with poor eyesight. The design does not appear to be done to benefit one party. Unless one particular group gets significant support from old voters, the ballot design flaws appear to be a product of an over-complicated electoral system and a lack of resources for the electoral authorities.